The Moreton Bay fig (Ficus macrophylla) is a large evergreen banyan tree of the Moraceae family. Its common name is derived from Moreton Bay in Queensland, Australia. It has small round fruits that begin as green and turn purple when ripe. They often have off-color splotches or blemishes. The fruit, as in all fig trees, is actually an inverted inflorescence called a syconium. This structure is hollow, and on the inside are dozens of tiny light-colored flowers; each one may develop into an individual fruit within the larger fig. A tiny hole in the fig, called an ostiole, can be found on its end; this permits fig wasps to enter the structure. Ficus macrophylla is a strangler fig; seed germination usually takes place in the canopy of a host tree and the seedling lives as an epiphyte until its roots establish contact with the ground. It then enlarges and strangles its host, eventually becoming a freestanding tree by itself. This plant may live for more than a century. The Moreton Bay fig is monoecious, meaning male and female flowers are found on the same plant. Because the fruit is actually an inverted inflorescence, it forms from multiple flowers; as a result, a single fruit from the Moreton Bay fig may have both male and female flowers. The Moreton Bay fig is a native of most of the eastern coast of Australia, from the Atherton Tableland in the north to the Illawarra in New South Wales, and Lord Howe Island. It has been introduced to many warm locations around the world. Ficus macrophylla is widely used as a feature tree in public parks and gardens in warmer climates such as California, Portugal, Sicily, and Australia. Its aggressive root system allows its use in only the largest private gardens. A Moreton bay fig on Isla Nublar, showing its prominent buttress roots. A Velociraptor has advantageously used these buttress roots as shelter for her nest of eggs. 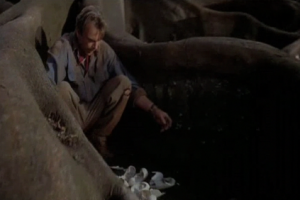 As of June 1993, this plant could be found in the forests of Isla Nublar. The Moreton Bay fig is known to exist in the former Velociraptor paddock and the primary herbivore paddock. It appears to be more common in the raptor paddock, with several visible throughout. This indicates that it was denser in population near the Jungle River and the central region of the island. As the Moreton Bay fig is not native to Central America, it would have been introduced artificially by InGen as a decorative plant. It may have been introduced in most of the developed parts of the island, but would not be able to grow on the central grasslands due to the lack of host trees. It is at least confirmed to have been introduced in two animal paddocks, and may have been present in other forested paddock areas. The visitor compound area would also have provided sufficient host trees. It is unknown if any Moreton Bay figs exist on Isla Nublar as of 2015, but the June 23, 2018 eruption of Mount Sibo likely destroyed any that remained. Depending on whether the fig wasp Pleistodontes froggatti was introduced to Isla Nublar alongside it, and whether the wasps thrived on the island, Moreton Bay figs may not have reproduced successfully on the island at all. 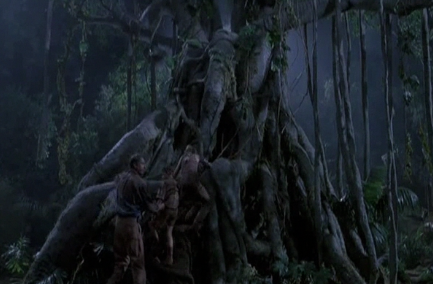 There is no evidence that the Moreton Bay fig was introduced to Isla Sorna. As it is a nonnative plant used for decorative purposes, it is unlikely that InGen would introduce any on Site B. During the day, the Moreton Bay fig performs photosynthesis to produce energy. In order to access sunlight, which it requires in order to convert carbon dioxide and water into carbohydrates, the Moreton Bay fig grows as an epiphyte on larger plants. Eventually, it will put down aerial roots which grow thicker upon reaching the ground. These support its increasing weight, and the tree becomes so large that it kills its host. By this point, it has grown big enough to tower above the canopy and obtain all the sunlight it needs. Most plants utilize chemical signals, such as hormones, to communicate. Specifics of how the Moreton Bay fig does this are not currently known. A mature Moreton Bay fig will produce a huge number of fruits. It will start the fruiting process at any time of the year, but is most productive from February to May in real life. In actuality, the “fruits” are an inverted form of inflorescence called a syconium. Tiny flowers are found on the inner surface, and these are pollinated exclusively by a species of fig wasp called Pleistodontes froggatti. The female wasp lays her eggs within the fig while depositing pollen into the female flowers, and then dies. Her offspring mature rapidly, and the wingless males mate with the females inside of the fig. The male wasps then begin to burrow out of the fig, creating an escape route for the females who are now laden with pollen from the male flowers. The females disperse to begin the process again, and the males die shortly after leaving the fig. Once the fruit has ripened, it is fed upon by numerous animals such as birds and monkeys, which serve to disperse the seeds that result from the wasps’ pollination. Because each individual flower can develop into a tiny fruit inside the fig, it can produce a great number of seeds. Many plants communicate with one another using chemical signals. Figs in particular have symbiotic relationships with fig wasps, and their fruits have evolved over at least eighty-three million years to signal to the wasps. When the fig is receptive to pollen, the ostiole loosens slightly to allow the wasps in. Moreton Bay figs are considered strangler figs, meaning that they begin their life cycle as an epiphyte on another tree. Eventually they grow large enough to strangle their host, becoming a free-standing tree. Their buttress roots can also disrupt their immediate environment. This makes the Moreton bay fig an ecological threat to some plant life on Isla Nublar. However, it also provides some benefits to animals. Its fruits are often eaten by birds, and its enormous size allows it to be a habitat for small creatures. Its foliage may also serve as food for Brachiosaurus, and its buttress roots make for sheltered areas where small dinosaurs such as Velociraptor can lay eggs. In real life, the fruit is also eaten by bats and monkeys. Pollination is carried out by Pleistodontes froggatti, a species of fig wasp. Other non-pollinating wasps may inhabit the tree, as do nematode worms that are parasitic on P. froggatti and other wasps. Thrips, plant-lice, and moth larvae feed on the leaves. Longhorn beetle larvae parasitize the tree, and the brown root rot fungus also affects it. Humans are responsible for the Moreton Bay fig existing on Isla Nublar in the first place, as it is naturally native to Australia. It is often used as a decorative plant, though its immense size means that only very large properties such as Jurassic Park can house it. As the roots grow, they can damage pipes, paths, roads, and other infrastructure. The wood, however, is sometimes used to make cases, and its fibers are used by the Australian Aboriginal people to make fishing nets. The fruit can be eaten by humans, but most find it dry and distasteful. In addition, the fruit may contain a very small wasp carcass. The Moreton Bay fig tree has become invasive in Hawaii, where Jurassic Park was filmed. 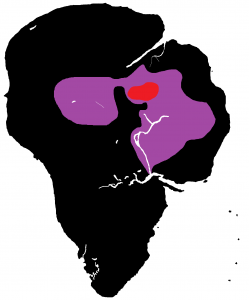 In real life, it thrives on the islands because Pleistodontes froggatti was intentionally introduced to the island in 1921 to allow the trees to reproduce. It grows on introduced and native trees.